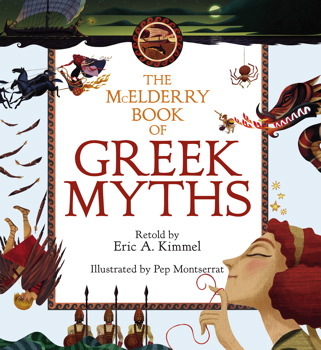 A note from the author prefaces this beautiful book of ancient tales, asking the reader 'Why Greek Myths'? Well, firstly, and quite simply - they are wonderful stories. Secondly, these myths are the foundation of language and literature. They also stretch our imagination and inspire us to dream. Encouraging children to look into the past and immerse themselves in classic fables is a magical way to elicit a love of storytelling and reading. This truly beautiful book takes twelve well-known and perhaps not-so-well-known Greek myths, and retells them in a format for younger children that will inspire and delight. Tales include such classics as Pandora's Box, Jason and the Golden Fleece, King Midas and the Golden Touch, and Perseus and Medusa. Other stories include Persephone and Hades, Pygmalion and Eurydice, and Theseus and the Minotaur - tales that can be both explored and paralleled with modern day adages, beliefs and customs. Superb illustrations blend modern technique with classic colour and style, hinting at traditional Greek imagery whilst still retaining contemporary styling and whimsy. A priceless book for schools and libraries, but also one that will enchant and transport eager bedtime readers - or even Mum and Dad.